Would You Pay $5,500 For A Rare Fancy-Pants 1988 Yugo GVX? Today’s Nice Price or Crack Pipe Yugo has lots of features, including a defroster on the rear window, you know, to keep your hands warm while pushing it. That’s just one of many jokes Yugo owners have to endure. Let’s see if this rare GVX’s price is yet another. Converse made its name selling high tops to millions of NBA/WNBA wannabes and Avril-channelling teenage Gurrrrls. The same sort of prodigious output can’t be said for a little company named LCM out of Elkhart Indiana. They built yesterday’s 1996 Ford Explorer High Top conversion, a mere 208 of them if its ad is to be believed. Not popular then and certainly an acquired taste now, that conversion came away with a 63% Crack Pipe loss to get the week started. Let’s keep the weird rolling. Hey, if the Yugo’s key arguement—its raison d’être if you will—was its low, low price, then what was the point of a more expensive Yugo? This 1988 Yugo GVX was just that, a way more expensive Yugo. Where did that extra cost go? Was it into more reliable materials and running gear? No. Was it into higher-quality construction and a more modern design? Sorta, the seats are covered in nicer material than the desiccated goat of the base model. Most of the extra cost went into a set of plastic rocker extensions and bumper caps that make the little Eastern European look, dare I say it, almost sporty. The GVX also offered a bigger engine with more horsepower. The 1.3-litre four here giving up 61 horses to the standard 1,100-cc’s 55. The GVX came with a five-speed manual too, although the shifter was still as rubbery as an un-boxed gimp. That pumped up drivetrain wasn’t too big for its britches however, still allowing the spare tire to share space under the car’s diminutive hood. This one comes with what’s claimed to be but 24,500 miles on the clock. That’s because it was apparently warehoused for a number of years then used as school transportation—ironically no doubt—by its car-dealer owner’s son. It comes in white over a grey with red highlights interior and factory alloy wheels. The ad notes a tear in the driver’s side door card, a shift knob that hasn’t stood the test of time, and various minor imperfections on the outside. One of those would be the tops of the plastic rocker extensions which look to be down to the base plastic on the tops. At least by now all the odd outgassing of the various plastic parts on the interior and exterior is probably over. Two of the most at-risk of those plastic parts on the interior are the thin, fragile door handles that curl out from the door panel like the middle finger of one of those creepy Aye Aye animals. Yech! On the plus side, it does have louvers on the back window. We love louvers, right? Of course that renders my initial joke at the little Yugo’s expense even more unfair as using the back window to push the car would require their removal or at the very least un-hinging. The need to push the car will probably be about 50/50 as the while the ad notes that it runs fine, it has issues at idle. I’d expect the cause of that to be an issue with the idle circuit on the carb caused by years of non-use. Either that or the spare tire’s talking smack up there and the engine is challenging it to a fight rather than getting on with the whole doing its job business. One day there won’t be any more Yugos on the road in the U.S.. Most will have fallen victim to parts availability and people giving up on them, while the nice ones will exist only in collections and museums as the last of their kind, or perhaps representative of cautionary tales. 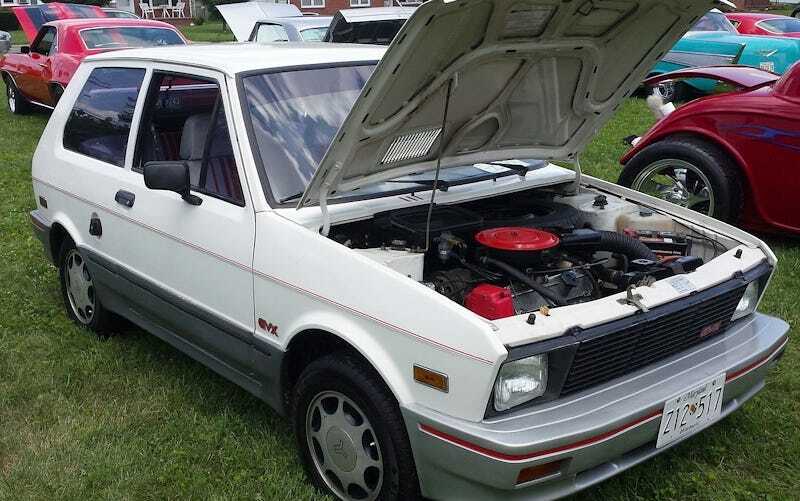 Before that happens you can get your Yugo on, and what better way than with this GVX? And yes, GVX isn’t the greatest three-letter special model identifier ever, but hey, this was Yugo, remember? The cost of entry here is $5,500 which is still less than the car’s original sticker of around $7,000 when the GVX was new. Now that it’s old, but seemingly well preserved, what’s your take on paying that $5,500 for this GVX? Does that seem like a fair price to make a last stand in support of the Yugos? Or, does paying that much mean that Yugo-ing to be sorry? eBay out of Manchester Maryland, or go here if the ad disappears. H/T to DRubble for the hookup!